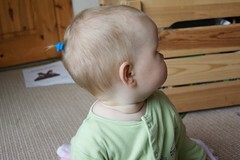 Hmmm, the hair's not quite long enough yet! Given that I have spent the last 8 years fighting with Charlotte about bobbles and tidy hair I thought I'd start early with Anna... I'm not sure she has quite enough yet, but it is definitely getting there.